Please, pick a show length and try to stick with it. Two-and-a-half hours is pretty gawdawfully long, and reduces the time people have to listen to other Pagan (or whatever) Podcasts. At least your show isn't one of those miserable things filling two hours with 15 minutes of material, and an endless series of "can you hear me" and "oops" interspersed with ever-increasing lengths of dead air, as well as loud vocal responses to those in the show's "chat room" that nobody else heard or saw. You're also NOT one of those newbie-produced Wicca-101 shows disseminating misinformation and totally incomprehensible interpretations of history and the principles of a) Wicca, b) Paganism, c) magic, d) religions, e)f)g)... everything else in the world. And for those kinds of things which are blessedly lacking from Inciting a Riot, I thank you. Just, a more reasonable listening length, please. -- It could mean more episodes to use all the material, you know. So sorry to have inconvenienced you by my show's length. Sadly, though, I don't know that I will be sticking with a given show time. I put the shows out when I can, and if it's been a few weeks in between shows - and I know it might be a few more until the next - I try and put out a show with enough content to sufficiently satiate that amount of absence. Also, if I have a lot to say, I'm going to say it. Likewise, if I have very little to say, the show will probably run an hour to an hour and a half, if not less. To be fair, out of the last 4 episodes, only one has been under 2 hours - it was 1 hour 50 minutes. So, it could be argued that I am, indeed, sticking to a time length. 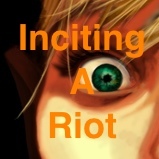 I encourage you to pause my show and listen to your other favorite pagan podcasts, coming back to the Riot when you have time and inclination. I don't expect anybody to listen straight through, which is why I am indexing the show. Again, sorry to have inconvenienced you with my 'gawdawfully' long show, but it is what it is. Hi and love the show! Quick question - how is Islam older than Christianity? As far as I've studied it, it's around 1500 years old, while Christianity is arguably 1700-2000. Perhaps you mean by adding the pre-Islamic cultures like Babylonians, Mesopotamians, Assyrians, etc etc and religious beliefs like Zoroastrianism then yea, but it's not the same, correct? It's always seen as the youngest of the three Abrahamic faiths. Serenilla, you are absolutely correct. I knew when I said it that I was mis-speaking. Christianity is - depending on your source - 200-500 years older than Islam, which rose in the early to mid-600's. Thanks for pointing that out, and I will try to remember to make a correction on the next show!